The following DVDs have been added to our collection this week. You will find them on display at the library desk. Click on the call number link to see if they are available, and see library staff if you need any assistance. ART21 is an award-winning series of 24 programmes in which 100 contemporary artists talk about their creations, the way they work and their individual view of art. How do artists evoke and transform time in their work? Can a work of contemporary art be timeless? How does contemporary art relate to art of the ancient past, to nature and to the rhythms of the life? 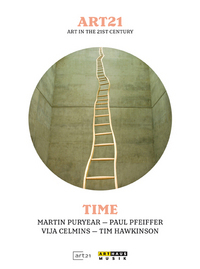 The “Art in the Twenty-First Century” documentary “Time” explores these questions through the work of Charles Atlas, Martin Puryear, Paul Pfeiffer, Vija Celmins and Tim Hawkinson, including an introduction by Merce Cunningham. Alexie Glass-Kantor is Executive Director of Artspace in Woolloomooloo. She sits on the National Art School’s Academic Board, is the Chair of the Contemporary Art Organisations of Australia (CAOS) and is curator of the Encounters sector for Art Basel | Hong Kong 2015-2018. In all her work, Alexie Glass-Kantor is a strong advocate for positive change in the arts, she supports artists’ rights and recently coordinated meetings to debate funding cuts in the arts sector. In her Artforum lecture, Alexie Glass-Kantor discusses Artspace’s on-going commitment to experimentation in art, collaboration between organisations and advocacy. She discusses ways Artspace supports the commissioning of contemporary art, publishing initiatives, and research residencies for artists and curators. Established in 1983, Artspace is a leading interdisciplinary space for the creation and presentation of contemporary art through exhibitions, performances, artist residencies and public programs. With more than 30 years of activity, today Artspace is a dynamic hub where artists of all generations test new ideas and shape public conversation. Prior to joining Artspace in November 2013, Alexie was Director/Senior Curator of Gertrude Contemporary (Melbourne), where she led a program that included exhibitions, studios, international exchange programs, curatorial research and publications. She has curated or co-curated more than fifty exhibitions. This week’s Art Forum presents Djon Mundine OAM, Guest Curator of Sixth Sense, in conversation with exhibiting artists Fiona Foley and Karla Dickens. Djon Mundine is a member of the Bandjalung people of northern New South Wales. He is an independent curator, writer, activist and occasional artist who has held prominent curatorial positions in many national and international institutions, including the Art Gallery of New South Wales, Museum of Contemporary Art Australia and Queensland Art Gallery. Between 1979 and 1995 he was the Art Advisor at Milingimbi and Ramingining in the Northern Territory and in 1988 he conceived the land-mark project The Aboriginal Memorial, an installation of 200 hollow log coffins from central Arnhem Land, displayed permanently in the entrance foyer of the National Gallery of Australia. Fiona Foley is a leading contemporary artist of the Badtjala people, Fraser Island, Queensland. She studied at the National Art School in the early 1980s and afterwards at Sydney College of the Arts and the University of Sydney. She is highly respected for her powerful works across a range of media, from installations to digital media and photography. Her permanent works include Edge of the Trees (1995) on the forecourt of the Sydney Museum, and she has numerous other important artworks in the public domain in Brisbane, Canberra, Melbourne and Sydney. In Sixth Sense Foley presents a major new work titled IOU (2016), a response to an extended visit to the Pilbara region in northwestern Australia. Wiradjuri artist Karla Dickens was born in Sydney in 1967. She began her formal training as an artist at the National Art School in 1991, obtaining a Fine Arts Diploma in 1993 and a Bachelor in Fine Arts in 2000. Dickens’ sculptural works comprise found objects that she assembles and invests with powerful stories of physical interaction. She often incorporates text in her work. Through her numerous solo and group exhibitions, Dickens fosters a cross-cultural and intra-gender dialogue through contemporary art.